Isaiah Baier lost his hearing due to meningitis when he was 21 months old. Thanks to a cochlear implant and a hearing aid he was able to hear again and live a life like any other boy – most of the time. 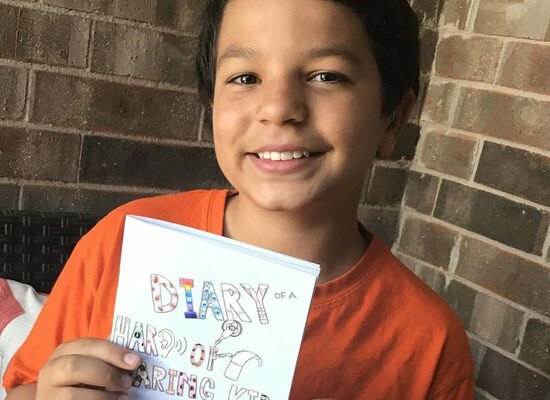 This spring, at the age of 11, he decided to write a book and to donate all the profits to the Hear the World Foundation. The book is a diary about his experiences with hearing loss and handling of the hearing devices. Each story includes an illustration drawn by Isaiah. This is a book that makes you smile and helps you better understand the challenges and obstacles that children with hearing loss often face. Isaiah, what was your motivation to write this book? I have always loved writing and drawing, and I thought it would be cool to write a book about my life. I wanted to encourage other people who have hearing difficulties and let them know that they are not alone. Because I wouldn't want to feel alone, it's not easy being different. I have felt alone in certain situations. You write with a lot of humor and never take yourself too seriously. But did you have times when you lost hope? Yes, I have sometimes been down on myself about my hearing loss and I have felt angry that no one knew what it felt like. No one understood me. When I would get mad at people, I would keep it inside and stay quiet, except for at home. Just not around my friends. How did you get back on your feet? But also, God helped me get back up. What do you advise other children in similar circumstances? Is there something you do that always helps you? I advise other children with hearing difficulties to stay strong no matter what. After all, not many people get to be bionic! I play the piano to express my feelings, so do whatever you like doing and it may help you feel better about yourself. Do you have a lot of stories that didn’t appear in this book? Oh yes, tons. Almost every day I could add a new story! Have you already thought of writing another book or maybe writing a blog? Yes, I am actually writing another book. The title is, "The Man in the Window," a mystery book based in Sweden. This book has nothing to do with my ears but that would be fun to write a series based on the first book. And when did you decide to publish your diary? From the beginning of writing it but we didn't think it would be big. We printed the book ourselves at a local copy shop. And then my mom told everyone and their dog about me on Facebook. Then the news found out and interviewed me! The interview showed in Lubbock, Abilene, and then Dallas Texas! After that, we had to put the book on Amazon because the demand increased rapidly. What was the reaction you received from others when you shared your book? I received many letters from my readers in addition to positive feedback from others. Some people want me to write another book. Did you know right away that you want to donate all the profits? No, at first, I thought I was going to only give 30 percent. Then after talking to my mom, I decided to give all of the profits. I have everything and they are still in need. There are like a million people who don't have ears and I am not going to stop until they all do. It feels better to donate the money because others will benefit and appreciate it more than I would if I kept it. Also, it just feels good to help people in that way. What made you choose the Hear the World Foundation as a recipient of your profits? My mom and I found one of your videos on the internet and I was touched. I saw children's reactions the first time they received their ears and I know that used to be me and I want them to feel that joy! Isaiah lives in Lubbock, Texas with his parents and his siblings, an older brother and a younger sister. He loves to play soccer, play the piano, ride his bike. His greatest wish is to be present when another child with hearing loss receives the gift of hearing for the first time. We are working really hard to make that wish come true for Isaiah!